Description: WYE Tower. Here is an original photo that I took of Pennsylvania Railroad property at the Wye Switches in Duncansville, Pennsylvania, on 28 July 1960. Shown here is the PRR's WYE Tower. 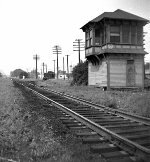 The men who worked here controlled rail traffic on several lines: Hollidaysburg to Altoona, Hollidaysburg to Bedford, Hollidaysburg to Petersburg, plus Hollidaysburg to Gallitzin via the New Portage Branch Line. Approaching from Altoona is PRR engine #7923, an ES-12 built by EMD in 1958 and rated at 1,200 horsepower. With no cars in tow, it is on its way from the Altoona Yards to the Hollidaysburg Yards. Also visible is the railhead facing West, toward Duncansville and the Allegheny Mountains in the hazy distance. From 1834 until 1854, this was the right-of-way for the Allegheny Portage Railroad. And from 1850 until 1854, this location was known as "New Portage Junction" since it was the eastern junction of the New Portage Railroad and the Pennsylvania Railroad (coming from Altoona). Description: 8th Street. Here is an original photo that I took of Pennsylvania Railroad locomotives in Altoona, Pennsylvania, on 12 January 1964. Shown here (R to L) are PRR engines #9454, #9630-B, #9717, #9594, and #8576. #9454 is an FF-16 built by Fairbanks-Morse in 1950 and rated at 1,600 horsepower. #9630-B is an AF-16 built by the American Locomotive Company in 1951 and rated at 1,600 horsepower. #9716 and #9594 are BF-16's built by the Baldwin Locomotive Works in 1951 and rated at 1,600 horsepower each. #8576 is an ES-15M built by EMD in 1953 and rated at 1,500 horsepower. They are about to pass under the 8th Street Bridge in Juniata on their way to the East Altoona Roundhouse for servicing. Visible in the immediate background are at least eight cabin cars and PRR engine #7923, an ES-12 built by EMD in 1957 and rated at 1,200 horsepower. Description: Extra Board. Here is an original photo that I took of a Pennsylvania Railroad train in Frankstown, Pennsylvania, around noon on 11 July 1964. Shown here is PRR engine #7923, an ES-12 built by EMD in 1957 and rated at 1,200 horsepower. It is pulling pulling three PRR H-43A covered hopper cars which have recently been filled with sand. They are crossing the unpaved access road that leads into the PRR's Reclamation Plant. Anyone recognize either of the railroaders in the photo? Description: Extra Board. Here is an original photo that I took of a Pennsylvania Railroad train in Frankstown, Pennsylvania, around noon on 11 July 1964. Shown here is PRR engine #7923, an ES-12 built by EMD in 1957 and rated at 1,200 horsepower. It is about to cross the unpaved road leading to the PRR's Reclamation Plant with three H-43A covered hopper cars that were recently filled with sand. Description: 4th Street. 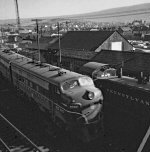 Here is an original photo that I took of a Pennsylvania Railroad locomotive in Altoona, Pennsylvania, on 09 September 1964. Shown here is PRR engine #7923, an ES-12 built by EMD in 1957 and rated at 1,200 horsepower. Its crew is busy switching cars in the Altoona Yards near the 4th Street Bridge. Description: Slope to Works. Here is an original photo that I took of Pennsylvania Railroad trains between SLOPE and WORKS Towers in Altoona, Pennsylvania, on 06 June 1965. Shown here (L to R) are PRR engines #7923 and #8618. #7923 is an ES-12 built by EMD in 1958 and rated at 1,200 horsepower. #8618 is an AS-18M built by the American Locomotive Company in 1956 and rated at 1,800 horsepower. They are pulling a mixed-cargo train that originated in Hollidaysburg into the Altoona Yards, and are about to pass under the new 4th Street Bridge. Also visible are two locomotives returning to East Altoona from helper/pusher duty. Shown here (L to R) are PRR engines #8656 and #8675. Both are AS-18AM's built by the American Locomotive Company in 1958 and rated at 1,800 horsepower each.